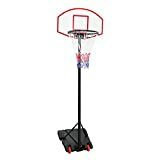 With more flexibility with regards to height and location, portable basketball hoops are a popular hoop choice. Because they are easier to install and can be adapted to suit the age (and height) of any player, they are an ideal choice for families. 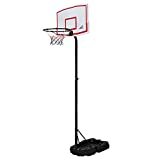 There are a lot of portable basketball hoop options available and finding one you will be satisfied with may seem harder than a turnaround jumpshot. That is why we have put together this comprehensive portable basketball hoop buying guide, helping you quickly and easily find the perfect hoop. Pneumatic Portable Basketball Hoops: Using pneumatic pressure to adjust the hoop heights, these require less physical effort. 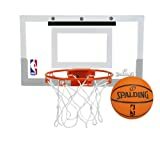 A good value choice, pneumatic portable basketball hoops are easy to setup and adjust. 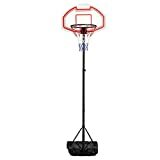 Crank Portable Basketball Hoops: These kinds make use of a crank to alter the heights of the pole. They are durable and offer great accuracy in height adjustment. 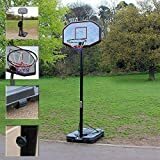 Build: Owners that note that their portable basketball hoops are light enough to move around when needed and offer good quality working backboards review their hoops well. Assembling: Portable basketball hoops that are frustrating to assemble do not get good reviews. Simple to install and easy to follow instructions are big contributing factors to buyer satisfaction. Stability: Hoops that are lightweight and stable are the kings of portable basketball hoops, getting the highest ratings by online reviewers. 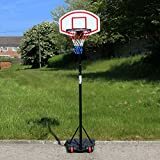 Expectation: Portable basketball hoop buyers that understand that portable hoops are not meant for professional players and practice appreciate their hoops much better than those that expect to find league specification in their portable models. Let’s talk rims! Hoops either come with breakaway or spring-loaded rims. Because spring-loaded rims will detach from the backboard when too much pressure is exerted, they offer the most backboard protection. The standard size of a basketball hoop rim is 18 inches and between ⅝ and ½ an inch thick. A good quality portable basketball hoop should meet these measurements. How portable do you need your hoop to be? If you will need to move it frequently, opte for a lighter model. Where will you be playing? It is recommended before buying your portable basketball hoop that you check with your homeowners’ association regulations (or neighbors) to make sure that you are able to put the hoop where you want it without bothering anyone. To really enjoy the hoop, choose a flat, paved surface for more comfortable playing - especially avoiding inclines. Net length of most hoops are between 15 and 18 inches and the thread count offered is anywhere from 30 to 120tpi. 30tpi nets are the cheapest options while 120 are the most durable option. 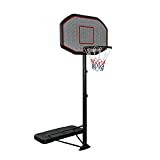 Portable basketball hoop backboards come in various sizes, with 45 inches an ideal choice for professional players and 72 inches perfect for beginners. Backboards are either fan shaped or rectangular, and rectangular shaped boards are better suited for beginners as it gives more space to shoot. Basketball poles range from four to six inch sizes and the thicker the pole, the more stability it will have and the bigger the backboard it will be able to support. 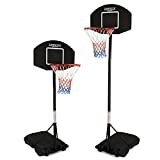 Some added accessories to consider buying with your portable basketball hoop are basketballs, basketball hoop nets, basketball shoes, and basketball clothing for comfortable play. Basketball training aids such as books and videos are especially useful for your young, aspiring ‘Michael Jordan’s’. For indoor play or much smaller areas, opt for an indoor hoop instead. Who is going to play and what is their skill level? Choosing your hoop based on the skill level of the players will ensure they get the most enjoyment out of it. For serious players and professionals,opt for standard basketball hoops over portable units. Lifetime: Lifetime was formed in 1986 with the goal of transforming basketball by bringing the game into the homes of consumers. They offer a wide variety of basketball systems to suit any preference and skill level. Spalding: With over 125 years in the basketball industry, Spalding are a leading basketball and accessories manufacturing company.